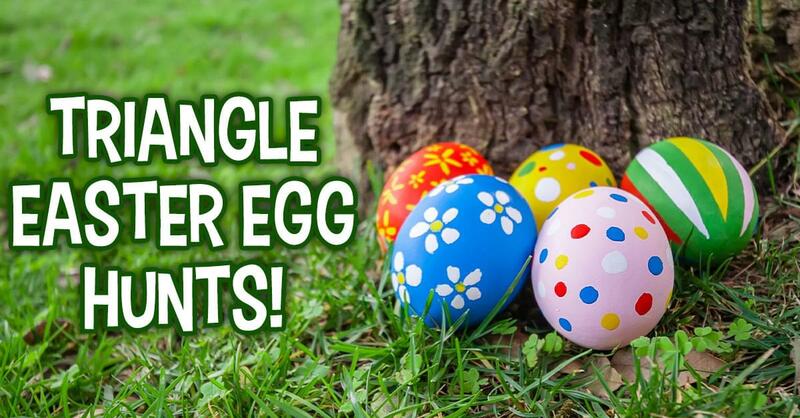 Calling all egg hunters! Check out where to find the best Easter Egg Hunts all over the Triangle! Free Community Egg Hunt and Bunny Visit in Hillsborough – There will be a Free Community Egg Hunt from 5:30 p.m. to 8 p.m., at River Park, 140 E. Margaret Lane in Hillsborough. Enjoy free crafts, Free visit from Easter Bunny, Inflatables, Face painting and more! Breakfast with the Bunny in Cary – Join the Easter Bunny for a delicious continental breakfast provided by the Cary Teen Council prior to Cary’s Easter Egg Hunt. Muffins, donuts, fresh fruit and more will be served. The Bunny will be available for photos and videos for ticket holders. Herbert C. Young Community Center, 9am – 10am. Cary Easter Festival – Meet the Easter Bunny, enjoy family friendly activities and entertainment at the boathouse, check out a Town of Cary Police Car and Fire Truck and meet with Police Officers and Fire Fighters! Fred G. Bond Metro Park, 9am – 12pm. Easter Egg Hunt in Fuquay-Varina – The Easter Bunny hops into town a week early on Saturday, April 13th at 10 am bringing thousands of eggs to South Park in Fuquay-Varina for the Town’s annual Easter Egg Hunt. South Park Fuquay-Varina, 10:00 am to 10:30 am. Wake Forest Easter Egg Hunt – The Town of Wake Forest is hosting a free Easter Egg Hunt on Saturday, April 13th, 2019, from 10 a.m. to 12 p.m., at E. Carroll Joyner Park, 701 Harris Road, Wake Forest. Great Egg Scramble – Free family fun event with a new fun fitness twist! Hop over to Brier Creek Community Center and enjoy a light breakfast with bunny, crafts and fun fitness stations. Breakfast starts at 10am with egg hunts following at 11am sharp. Feed Durham Festival, including egg hunt – Feed Durham is a community food drive organized by STORYCHURCH, 100 Pleasant Drive, and it culminates with the Feed Durham Festival. Easter Bunny Festival in Holly Springs Towne Center – Bring the kids to this free event at Holly Springs Towne Center, NC 55 & New Hill Road, Holly Springs, from 11 a.m. to 2 p.m.
Easer Egg Hunt at Parkside Town Commons, Cary – Children 10 and under can hunt from over 25,000 Easter Eggs and visit with the Easter Bunny! 11:00 am to 2:00 pm. Spring Fling Adult Egg Hunt – Join Pulse FM and Dix Park for the Spring Fling Adult Easter Egg Hunt. Get ready for a fun-filled afternoon that celebrates the kid in all of us: The (kid-free) Spring Fling at Dorothea Dix Park – a field day for adults! 3:00 pm to 7:00 pm, Free. Egg Splash in Chapel Hill – Take to the water with Egg Splash, an underwater egg hunt! This event takes place at Homestead Aquatic Center, 300 Aquatic Drive, Chapel Hill, starting at 9:30 a.m.
Plastic-Free Eggstravaganza in Chapel Hill – This new event takes all of the fun of an annual egg hunt, adds STEAM activities, subtracts the plastic, and moves the whole thing downtown. The Eggstravaganza will transform an urban space into a Spring garden and will feature egg hunts starting every 15-20 minutes. The egg hunts will employ reusable wooden eggs, painted by UNC arts students. 1:00 pm to 4:00 pm, 140 West Plaza. Wee Walker Egg Hunt – Join an egg hunt just for our Wee Walkers! Have your little one bring a basket to find the hidden eggs and the surprises that are inside. 10:00 am, Durant Nature Preserve. Wendell community egg hunt – There will be 15,000 eggs! The egg hunt is for kids age 0-11, but all ages are welcome to enjoy the activities, which include inflatables and more. 10:00 am, Wendell Community Park. Community Easter Egg Hunt at Burwell School Historic Site – A free Community Egg Hunt at 1 p.m.
Flashlight Egg Hunt (ages 11-14) – Youth ages 11 to 14 are invited to bring their flashlights out and enjoy a fun Egg Hunt in the dark! “Special Golden Eggs” will be hidden for special prizes! This year will also feature special glitter eggs for other prizes. 8:00 pm, Wilson Park, Carrboro.